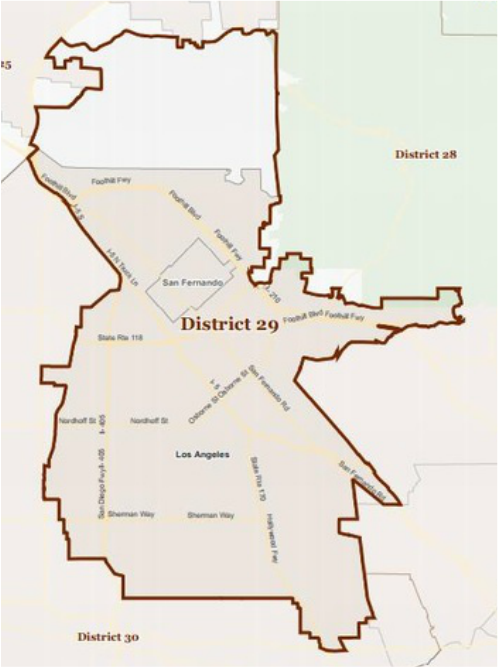 Democrat Tony Cardenas currently represents Congressional District 29. Cardenas is expected to easily win re-election in 2016. Raised by hard-working immigrant parents, Tony Cárdenas was brought up with simple ideals – that integrity and dedication were the keys to success. These are the qualities that he has brought to his 16 year career as a public servant for the people of the North East San Fernando Valley, and that he continues to offer today as a United States Congressman. Cárdenas has also been chosen to represent Los Angeles on the prestigious House Committee on Energy and Commerce, the oldest of the "authorizing" committees in the House. He also was chosen as a member of House Democratic Leadership, working with House Minority Whip Steny Hoyer as an Assistant Whip. Cárdenas was first elected to the California State Assembly in 1996. He went on to serve three terms in the assembly and was later elected to the Los Angeles City Council, in 2003. An engineering degree, and a business background, prepared him for the day-to-day duties of an elected official and his experience has allowed him to find practical and realistic solutions to difficult problems. Born in Pacoima, Cárdenas was raised with ten brothers and sisters and still resides in the San Fernando Valley with his wife, Norma, and their children. As a state legislator, Cárdenas focused on ensuring that his community received the programs and services they needed, while he made sure the state’s finances were managed responsibly. As Chair of the State Assembly’s powerful Budget Committee, Cárdenas oversaw the most robust reserve budget in the history of California. His state reforms brought 78,000 new classroom seats to Los Angeles, as well as 15 universal playgrounds throughout the city. He also secured more than $650 million for new school construction in Los Angeles to help relieve overcrowded classrooms. It was in the Assembly, that Cárdenas began working on juvenile justice issues. His state legislation included the overhaul of California’s gang prevention and intervention programs, with the passage of the Schiff-Cárdenas Juvenile Justice Crime Prevention Act. He brought his passion for juvenile justice to the Los Angeles City Council. As Chair of the City’s Ad Hoc Committee on Gang Violence and Youth Development, Cardenas identified millions of dollars overlooked by the City to help keep kids off the streets, and reduced crime while reducing expenditures on crime abatement programs. As Vice Chair of the City’s Public Safety Committee, Cárdenas spearheaded the most comprehensive gang intervention model in the country. The Community-Based Gang Intervention Model standardized and defined the methods used by gang intervention workers to help stop violence in some of LA’s most dangerous neighborhoods. In 2012, Cárdenas also passed landmark amendments to the City’s daytime curfew ordinance. The new policy eliminated costly fines, of up to $500 that students were facing. It also reduced lengthy court visits for parents and students, and gave students the opportunity to do community service to eliminate their citations. As an animal rights advocate, Cárdenas also created Los Angeles’ first Animal Cruelty Task Force which, for the first time, targeted animal abuse city-wide. One of the task force’s first felony convictions put a known gang member away for three years for abusing a family pet. Cárdenas also co-authored the City’s mandatory spay/neuter ordinance, helping Los Angeles become the largest no-kill city in the country. Cárdenas also launched the city’s first Task Force on Human Trafficking and Child Prostitution, addressing an often overlooked crime. The U.S. Department of Justice estimates that 14,000 to 18,000 people are trafficked into the country annually in Los Angeles. Attacking persistent blight in his community, Cárdenas launched district and city-wide efforts to improve the environment. Community clean-ups in his district collected more than 56,000 tons of trash and bulky items during his tenure and Cárdenas added more than 100 acres of new park. Cárdenas demanded that L.A.’s Department of Water and Power establish its Renewable Energy Portfolio Standard, laying out specific goals and timelines for their use of clean energy. And he consistently drafted and supported green energy legislation including his plan to convert the City’s taxi fleet to fuel efficient vehicles. After 16 years in public office, Cárdenas has made history, becoming the first Latino elected to represent the San Fernando Valley in our United States Congress. He will continue his passionate commitment to the community in Washington.